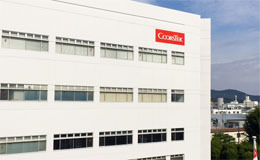 Hadano Facility, located in Hadano, Kanagawa Prefecture, serves as the hub for the CoorsTeks technology businesses. It is home to the Technology Development Center, which is where we develop new products and new technologies, and it is also where manufacturing equipment and processes and high-precision processing technologies are developed. Other activities of Hadano Facility include the design and production of silicon parts and ceramic gas filters that are used in the manufacture of semiconductors, and the development of biocompatible ceramics for use as artificial bone fillers.